With the wave of grey hitting the design world this year, it's only prudent to reflect on an interior designed by someone with an excellent grasp of this often underestimated colour. Frank Roop's decision to use numerous shades of grey in his very own Boston home is nothing short of breathtaking ! It exudes calm, comfort and sophistication, with it's washed walls, velvet fabrics, and precise arrangement of furnishings. Colours pop against the muted grey background. The rich shades of Indigo blue and avocado green couldn't be more perfect. The collection of artwork is also spectacular. The metal sculpture over the fireplace in the dining room is a brilliant departure from the traditional canvas hanging. Contemporary art on canvas, with tones that perfectly balance each room, and even a gallery of photography add interest to this already enchanting interior. The entryway stunning, with venetian plaster on walls, mosaic tiles on floor and that wonderful green light fixture. 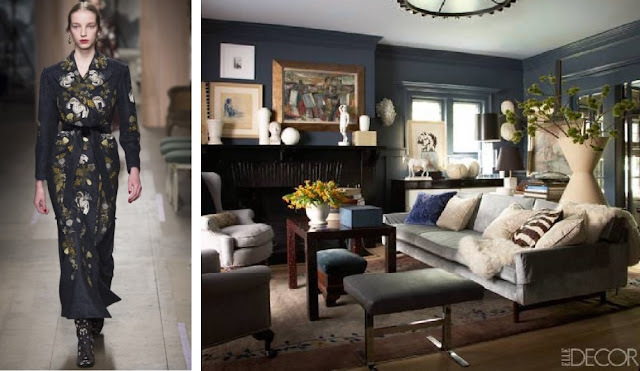 Inspired by fashion and clothing, Frank Roop's interiors really are like a perfectly tailored outfit that blend modern, Classic and vintage seamlessly.